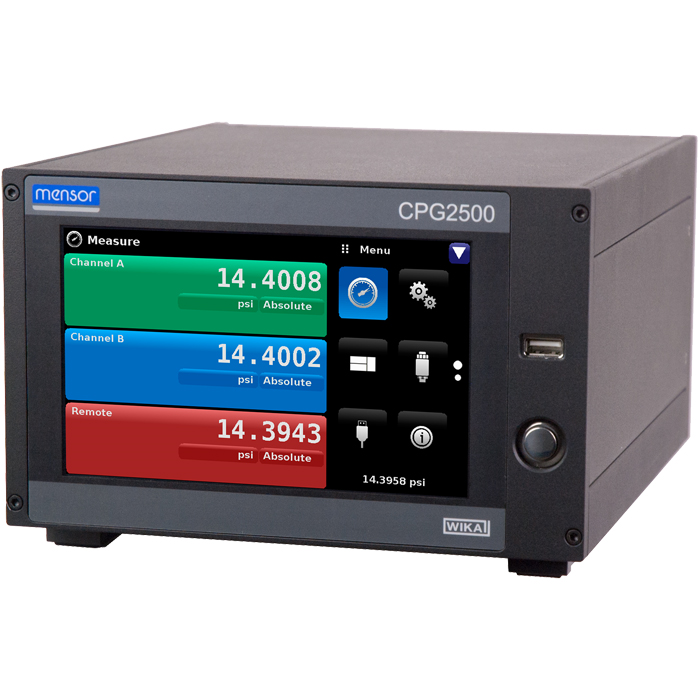 The model CPG2500 digital pressure indicator is used in calibration laboratories and manufacturing facilities as a source for precise pressure measurement. It is used to verify the accuracy of field pressure indicators/transmitters or as a laboratory standard and wherever there is a need for a high level of pressure accuracy in manufacturing, testing and calibration of pressure instruments or gauges. 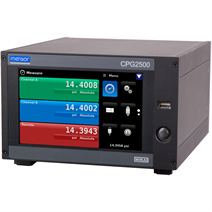 The CPG2500 digital pressure indicator can be configured with one, two or three pressure sensors. Two sensors are internal, and the third is external. The pressure sensors are pneumatically isolated so that one channel can be configured with a sensor as high as 690 bar (10,000 psi) and another as low as 25 mbar / 10 inH2O. An optional barometric reference sensor can be added internally to display barometric pressure or used to emulate gauge or absolute pressure. Pressure ranges for each channel are specified by the customer. Standard and premium sensors are available internally. External sensors are Mensor's CPT6100 or CPT6180 digital pressure sensors. See sensor chart on page 3 for ranges and uncertainty specification. With the IntelliScale specification, each sensor is calibrated to give a percent of reading in the upper portion of the range. Three sensors can be configured so that the percent of reading portions of their ranges are contiguous, giving a percent of reading accuracy over a wide range. In addition, each sensor is removable and interchangeable which allows remote recertification and quick sensor range changes while minimising downtime. The CPT6180 or CPT6100 external pressure sensor is also available for remote applications. In addition, each reference pressure sensor is removable and interchangeable which allows an external recalibration and range changes while minimising downtime. The model CPT6180 or CPT6100 external sensor is also available for remote applications.